Over the past twenty years, we’ve slowly seen this increase in the ever expanding genre of comic book movies. Thanks to the Marvel Cinematic Universe, we’ve been fortunate enough to see how well produced movies within this genre can be. We’ve seen other cinematic universes try to come and repeat the success. Streaming platforms, have also given us superhero based shows. Netflix has given us the Marvel shows, The Umbrella Academy & The Chilling Adventures of Sabrina. Hulu has graced us with The Runaways. Heck even, Amazon Prime has given us The Tick. Some of these heroes are iconic and some are cult favorites. Even with two previous big screen outings and two animated adventures – Hellboy has always been more of a cult favorite superhero and comic. Now, we are introducing the demon-turned-hero to a new generation thanks to David Harbour and Neil Marshall. The reboot of Hellboy tells the story of red & the B.P.R.D. (Bureau of Paranormal and Research Department) stopping Nimue the Blood Queen, played by Milla Johovich. The first thing I seriously have to praise is Harbour. In his first leading role, outside of the ensemble Stranger Things, Harbour harnesses a complex variation of the character. Harbour is beautifully sarcastic, while also being sympathetic. Hellboy is a damaged hero to say the least. He is a complex mess and Harbour honestly makes the character his own. Proving that the horns can be worn by more than Ron Perlman. It’s a good thing this movie is called Hellboy because Harbour is the film’s standout with good reason. His chemistry will Ian McShane's Professor Bruttenholm is impeccable. The two have a strength that stand out as two of the film’s biggest highlights. However, the film isn’t all strength. Hellboy’s reboot is unfortunate because it exposes all of his vulnerability to the audience. For starters, let’s discuss the tone of the film. In one moment, it’s a seriously dark horror movie feeling as though it belongs in The Conjuring universe. The next it feels almost like the writer, Andrew Cosby, watched too much Deadpool and said “I could do that with Hellboy”. Sarcastic, horrific and messy. Though, even in all of its sloppiness, there’s never a moment where you’re not entertained. The film opens on a flashback of Nimue’s reign and the genesis of her arc throughout the course of the film. The cinematography within this shot in gorgeous. It’s a black and white sequence with a kaleidoscope of colors. Presenting the audience with a world of wonder and beauty. Though that beauty quickly fades. 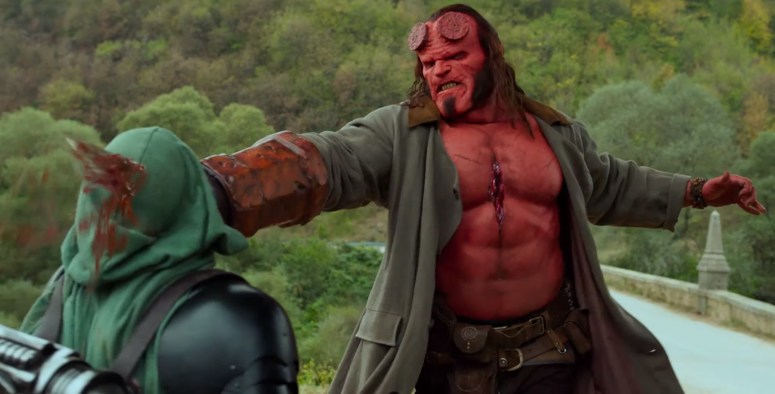 Thrusting itself into modern day and modern CGI – Hellboy is a CG nightmare. If you remember those complaints about the Will Smith Genie CGI in the upcoming Aladdin – just wait until you see Hellboy. The practical effects of character like Hellboy, Baba Yaga and even Gruagach to an extent stand out magnificently. It’s the CG world of the fantastical though that really makes this feel cheap and unfinished. It would have provided the audience a much better product had they chosen one medium or the other. Overall, Hellboy (2019), is a mixed bag of brimstone. Presenting an overly and unnecessarily busy film with way too much CGI. Big red doesn’t fair too well against the tone of the film. The overall nature feels unsure of itself in what it wants to be. Though it does have saving grace in David Harbour’s Hellboy, the practical effects and its’ entertaining charm. Hellboy will definitely split audiences but could go down as a cult favorite, much like the character has been for the past 20 plus years. Promo by Creature Feature Weekend & Ghosts of the Stratosphere . Music by Logan McElroy and Shawn Davis. The X-Files are property of Fox. We do not own nor claim any rights. The Flash & Man of Steel are property of Warner Brothers & DC Comics. We do not own nor claim any rights. Super Smash Bros is property of Nintendo. We do not own nor claim any rights. Hellboy is property of Lionsgate & Dark Horse Comics. We do not own nor claim any rights.